60 Great Founders: So That's How They Started! - Publisher :The influence of Christians is a part of our inheritance and a key factor in the creation of a moral fabric underpinning our society. For a society to function there have to be norms of acceptable behaviour. In a society that does not accept our the existence of God, right and wrong are relative terms that change with every fashion or political movement. Right or wrong are concepts that don't really exist without absolutes - fixed points outside society which are not changed by it. 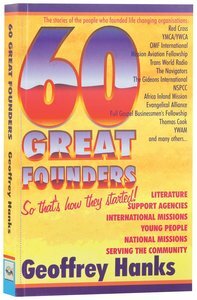 60 great founders tell the story of Christians who contributed to the setting up of organisations that changed people's lives and influenced what we call 'civilised society'. Without these people our lives would be poorer, through their foundational work our attitudes are closer to those who expressed by God in the bible. About "60 Great Founders: So That's How They Started!" :The influence of Christians is a part of our inheritance and a key factor in the creation of a moral fabric underpinning our society. The late Geoffrey Hanks was a teacher and respected church historian. Customer Reviews For "60 Great Founders: So That's How They Started!" The book is full of surprises! I didn't even know that the Red Cross founder, Henri Dunant, is a Christian. It's full of inspiring stories of how good organisations were started by ordinary people like us, with extra-ordinary faith.